Sick of being made redundant or having this threat constantly hanging over you? Sick of bowing and scraping to overpaid hierarchy who are full of their own self importance? Fed up with the profits from your hard work lining someone else’s pockets? Disillusioned with ‘airy fairy’ business plans that simply don’t work? Sick of writing CV’s and then having to suffer the humiliation of interviews and rejections? If so self employment could be for you! 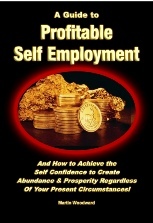 I have no qualifications and have been self employed for 44 years and survived numerous recessions. That’s right that makes me and ‘old git’! But one with a lifetime of knowledge and valuable advice. Pensions – plus much, much more!!! If you have few or no qualifications, you either have to spend a lifetime in menial employment - if you're lucky - or become self employed and create your own success! Every business involves a certain risk element. But the valuable information given herein will help you ensure that any risk is 'calculated' and not pure 'speculation'. The contents of this book have been written with a lifetime of experience by someone who has not only survived, but prospered during several recessions in a number of different occupations, mainly requiring no qualifications. Free Links to 5 of the most powerful inspirational books ever written. In fact if you read and absorb all of this information, you would find it more difficult to fail than succeed, regardless of your current financial or educational circumstances.